We have an affordable website design package for small businesses in Ilford and East London. Up to 5 pages with a fresh design, bursting with features and SEO friendly. At Webchefs we have years of professional web design experience. We've created successful websites for lots of local businessess from Ilford to South Woodford and we know exactly what it takes to create a web site to get a high Google ranking. We know how to get your customers to find you, just like you found us. We've designed websites all over East London and Essex and the following websites from our portfolio are all achieving first page Google rankings for popular local searches. A free website mockup - no strings attached! A website to match your branding - we design logos too! If you are nearby we would love to meet up with you and show you what we can do. We may even be able to mock up an example of what your website could look like. 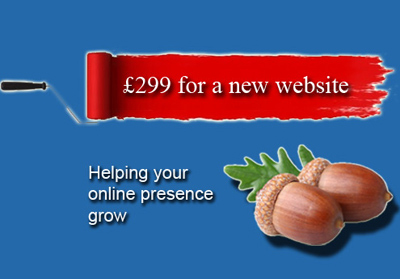 Right now we have a special offer of a 5 page website package to suit most small businesses. If you need something different or a little more, we can always provide you with a quote. We would love to to talk to you about your website. Either call us on 020 8220 1193 or submit the form and we'll get back to you today. Meet us for a free 'no strings attached' mock up. Webchefs we are experts in small business website design. We provide affordable web design Ilford east London, SEO, hosting and support services for small businesses.